From January through December, let's take a look at what West Virginia has to offer this year. Here's a month-by-month look at the best fishing hotspots this year in West Virginia. The new year provides a clean slate for the year to come, fishing adventures included! Whatever your favorite game fish, some months are “better” than others. Yet in every month of the year, there are some fisheries that are peaking. Consider the following 36 Mountain State destinations in your month-by-month angling plans for 2019. Few species bite as well during the winter months as do walleyes, particularly river-dwelling walleyes. The part of the Gauley River between Summersville Dam and the Gauley’s merger with the New River near Gauley Bridge, is worth investigating for winter river walleyes. 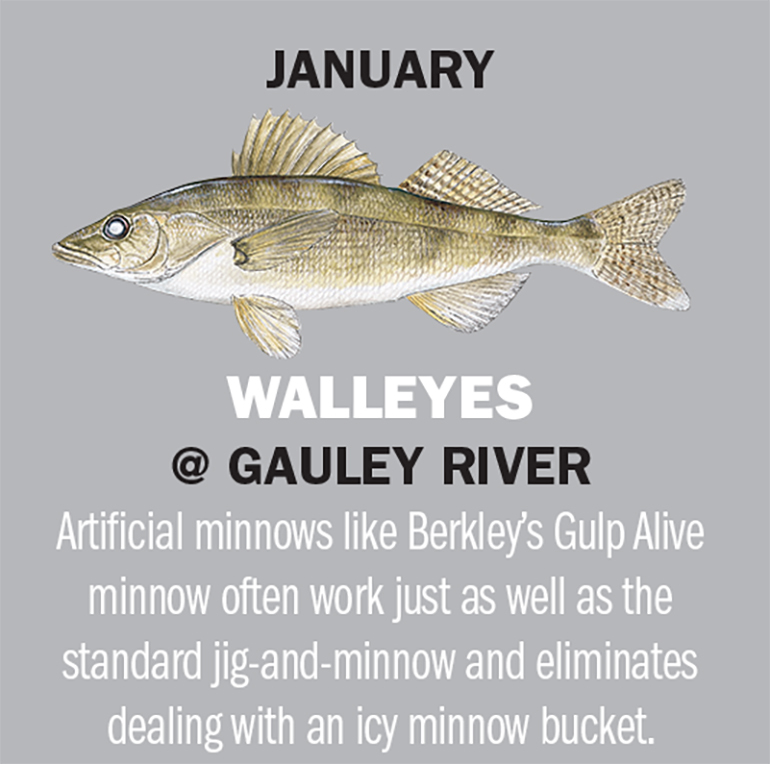 The simple jig-and-minnow remains one of the most productive of wintertime river walleye offerings. One of the biggest factors with the Gauley River is access. Access is good in the Summersville tailwaters area. Below the tailwaters area the river flows swiftly through a remote canyon — the Gauley River National Recreation Area — where good walleye habitat is limited. The lower portion of the Gauley is slower moving water, and provides the better walleye fishing. Check out the river section from Swiss down to where it joins the New River to form the Kanawha River, at K & M Junction. Public access areas are found at Persinger Creek in Nicholas County and Jodie in Fayette County. OTHER OPTIOINS: good choices also include the Ohio River for sauger, and the Monongahela River for hybrid stripers. West Virginia’s aggressive trout stocking program provides outstanding recreation on many rivers and creeks. Lakes too are part of the program, ones such as Stonecoal Lake. Stonecoal Lake is located in the Stonecoal WMA. The deep, cold lake covers 550 surface acres. Trout in stocked lakes such as Stonecoal often don’t relate to bottom structure and cover like warmwater species do, but rather suspend in the water column. Fish a variety of depths for cruising fish. Two concrete boat ramps are provided, as is fishing access for the handicapped. Boats are limited to 10 horsepower outboards. Stonecoal Lake is found in Lewis and Upshur counties near the towns of Weston and Buckhannon, a short distance off of Interstate 79. 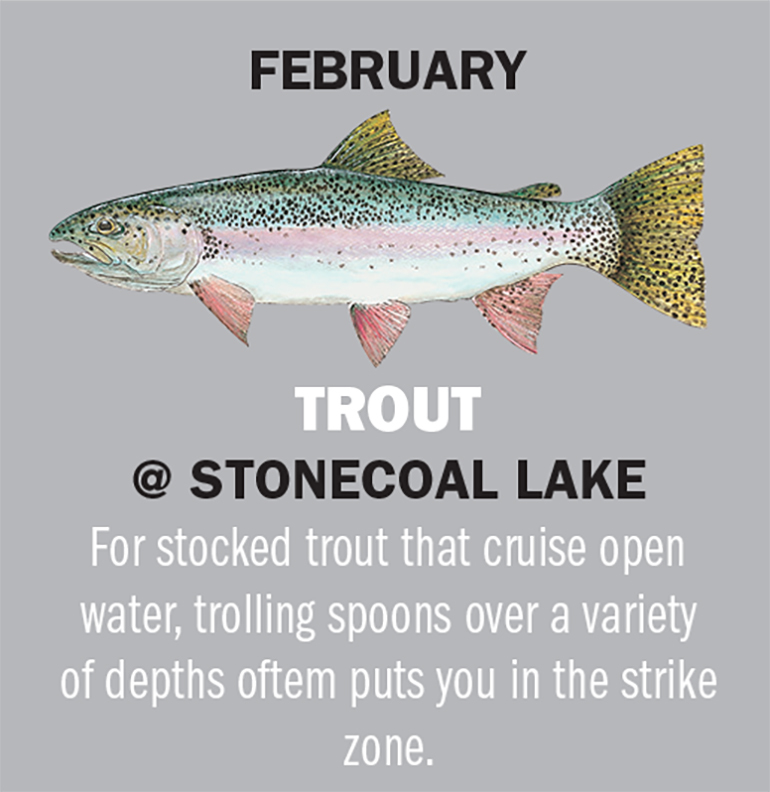 OTHER OPTIONS: If Stonecoal’s trout don’t interest you, perhaps the Elk River’s trout will, or maybe walleye action on the New River. Hard-fighting hybrid stripers can provide a good way of shrugging off the early spring cold. The Kanawha River is one of the state’s better hybrid fisheries. Focus your hybrid attention to the lower portion of the Kanawha River, where the lock and dam system creates navigation pools. Three dams are found there, structures that attract both fish and fisherman. Hybrid striped bass are eating machines, which means they will not be far from their food source. 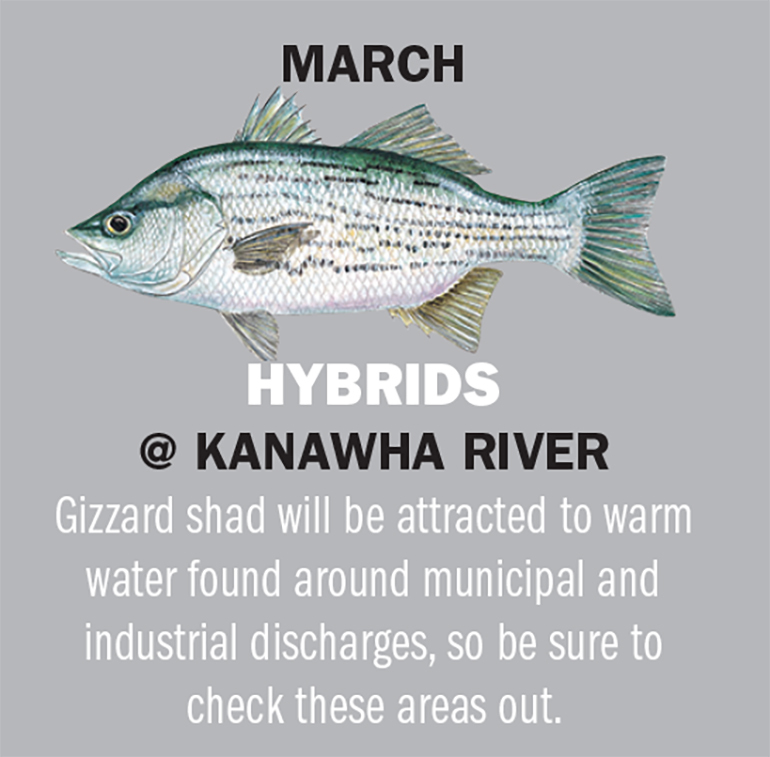 In the Kanawha, hybrids can be strongly focused on gizzard shad. Dams are located at London, Marmet, and Winfield. Shore anglers will find good access and facilities below the dams. Boat anglers can cash in on the action, but they will need to stay below the buoy line that marks the restricted area. Other options: For a stringer of March crappies, hit Stonewall Jackson Lake. Trout anglers will find good action in the North Fork of Cherry Creek. 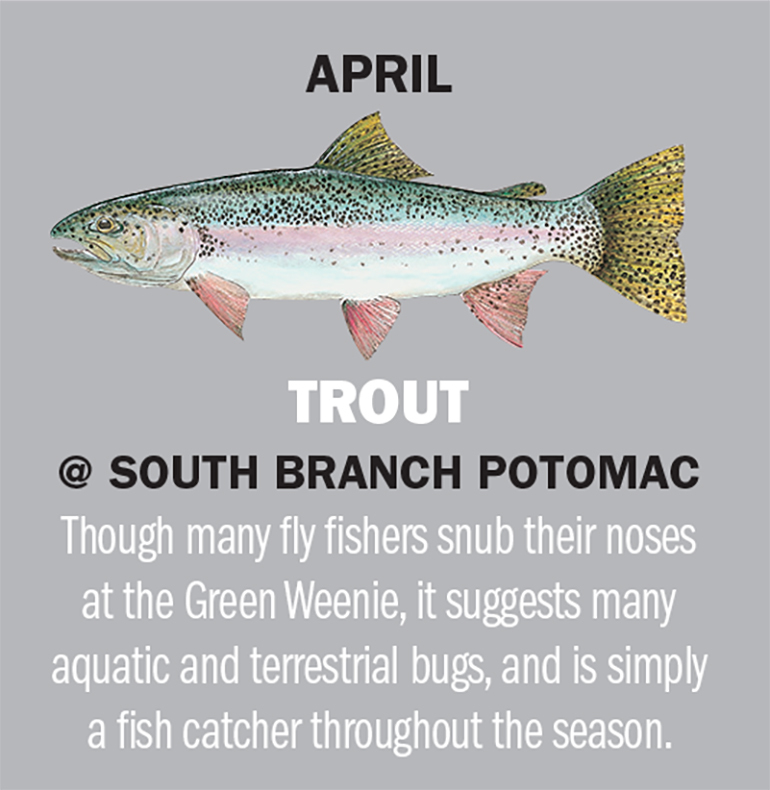 Come April, there’s no better place to be than on one of the state’s blue ribbon trout streams, which would have to include the South Branch of the Potomac. The state manages the South Branch in three sections – the Franklin, Smoke Hole and Catch and Release sections. The Franklin section is stocked from about a half-mile from the Virginia line downstream, past Franklin, to about two miles south of the Upper Tract, located near the old Poor Farm. Route 220 provides good access to most of this stretch. The Smoke Hole section runs from the Route 220 Bridge downstream to the Big Bend Recreation Area. U.S. Forest Service Rte. 74 provides access to a portion of this stretch, as does State Secondary Rte. 2. Located within the Smoke Hole section is a one-mile stretch managed as catch-and-release water. This stretch begins about 2 miles below the Rte. 220 bridge. OTHER OPTIONS: Besides the South Branch, consider April trout trips to the Williams River or Shavers Fork of the Cheat. It’s time to take advantage of one of the state’s best angling opportunities — river smallies. The New River provides one of the best places to pursue this activity. The 53 miles located within the New River Gorge National River contain some of the best smallie fishing, including a 12-mile catch-and-release section. The New River provides a blend of pools and fast water. During May it’s likely New River smallmouth bass will be in and around spawning areas. Access is limited. It may be wise to make use of an outfitter. Float trips are available that run from as little as half-a-day to overnight trips. River access is available in Fayette County at Hawks Nest Lake, McKendree and Stone Cliff. Raleigh County access areas include Glade Creek, McCreery and Sandstone Falls. The catch and release areas runs from the I-64 bridge down to the National Park Service’s Sandbar access area near Quinnimont. Access the area from either Rte. 41 or Rte. 20. OTHER OPTIONS: Summersville Lake walleyes provide another good May option, as do flathead and channel cats in the Ohio River. Stonewall Jackson Lake was developed with a more “enhanced” plan in mind than older Corps of Engineers flood control lakes. All anglers, but largemouth anglers in particular, continue to benefit from this. Unlike most state reservoirs, Stonewall Jackson Lake provides bass with plenty of cover. Flooded timber, present in many of this 2,650-acre lake’s bays and coves, will be one of the cover options you’ll want to investigate as you search out post-spawn bass, and by June Stonewall Jackson’s largemouths should be in the post-spawn mode. At this time a soft jerkbait like the Zoom Super Fluke is tops for working around points and flats that gather up bass. The 26 miles of shoreline present ensure it will take you some time to do so. Being a flood control lake, Stonewall Jackson is subject to changing water levels; it’s wise to check on conditions before embarking on a trip there. Daily lake and recreation information on Stonewall Jackson can be obtained by calling 304-269-7463. OTHER OPTIONS: Cheat Lake continues to be a solid bass fishing destination, and a good choice for June fishing. Sherwood Lake’s bluegills should be shallow and hungry as well. West Virginian’s take their catfishing seriously, not surprising when you consider the numbers of rivers and lakes that hold good catfish populations, primarily channel cats and flatheads. Burnsville Lake is one of these waters, and a good place to key in on for some mid-summer catfish action. An impoundment of the Little Kanawha River, Burnsville Lake covers just less than 1,000 acres. Not so typical of the state’s flood control impoundments, Burnsville is relatively shallow. It has a length of just shy of 10 miles. Both flathead and channel catfish are found in Burnsville Lake. Boat anglers should scope out deeper holes during the day using their sonar units. Then anchor up on the head of the hole at dusk and prepare for a very good night bite. No horsepower restrictions are in place. Launch ramps are located at the Riffle Run Day Use Area, Bulltown Day Use Area and the Bulltown Camping Area. OTHER OPTIONS: Good July choices are Buckhannon River muskies make for a good trophy-fishing destination in July. Second Creek trout are still active this time of year. When late summer comes around, and fishing for the “glamour” species gets a bit tough, the time is right to step back and do a little low-stress panfishing. Tygart Lake is a good place to gather up the kids for a trip aimed at bluegills. If you don’t find bluegills in the shallows, try working out in deeper water along Tygart Lake’s rocky shorelines. Tygart Lake State Park is located along the lake, and provides a camping option as well as a four-lane launch ramp. The City of Grafton also has a campground. There is no horsepower restriction on the lake, which is good for anglers, but also means the lake is visited by recreational boaters and water skiers. Phone 304-265-5953 for daily updated information on lake conditions and recreational information. 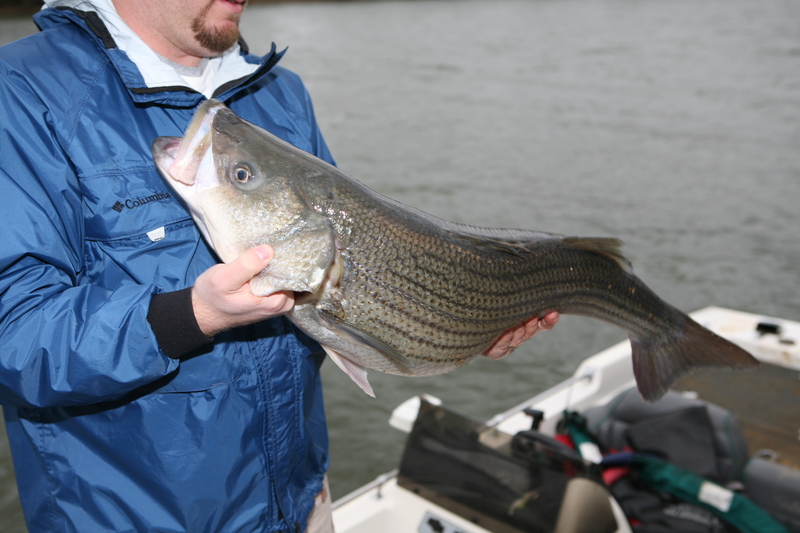 Other options: A great way of beating the August heat is to targeting hybrid stripers at Beech Fork Lake. Anglers interested in a fish fry can try catfish in Bluestone Lake. With quality muskie waters like the Buckhannon River and Stonewall Jackson Lake, it’s easy to miss out on the action from lesser-known waters. Mountwood Lake, which contains a viable tiger muskie population, is such a water. During early fall muskies will still chase down moving baits like flat-sided minnow baits. Mountwood Lake covers about 50 acres with a maximum depth of 48 feet. Despite its small size, it is capable of producing big muskies. Mountwood Lake is limited to electric motors only. A camping area, handicapped-accessible fishing pier and concrete ramp are provided. It is accessible off of Rte. 50 by way of County Rte. 5. OTHER OPTIONS: Tygart Lake’s bass often move shallow in September, making them a good choice. Hughes River muskies are worthy of a shot, too. The turning of the leaves makes the outdoorsman think of the many activities he or she can undertake. If only the month could have a few extra days? One outing the angler must pursue is river smallmouth action, with the South Branch of the Potomac being a quality venue. Early to mid-October is a good time to fish noisy topwater lures for river-dwelling smallmouth bass. Zero in on points and shelves where it’s likely bass will gang up on baitfish. Hardy and Hampshire counties play host to some excellent river smallmouth fishing on the South Branch, including two catch-and-release areas. Catch and Release Area 1 covers 8 miles of the South Branch. It starts 3 miles east of Petersburg at the Petersburg Gap Bridge. This section extends downstream to the Fisher Bridge (County Rte. 13 bridge). The second area, which takes in 9.5 miles, runs from the Romney Bridge down to the Blue Beach Bridge (Rte. 28 bridge). OTHER OPTIONS: Speaking of river smallies, the North Branch of the Potomac offers some good late-season fishing. And there are plenty of bass in Sutton Lake. The Cranberry River flows through Pocahontas County. Much of the land is national forest land. OTHER OPTIONS: If you like smallmouth bass fishing, try the Greenbrier before the weather gets too cold. Also, the tailrace of Tygart Lake is good for both trout and walleyes at this time of year. Muskies are present in the entire stretch of the Elk River from Sutton Dam down to its merger with the Kanawha River. But the best habitat lies in the portions that flow through Braxton and Clay counties. As water temperatures drop, river muskies will concentrate in the deeper, slower pools. Higher water flows, common in the fall, concentrate muskies in such spots. Access spots are numerous along this stretch of the Elk. In Clay County, there are Camp Associates sites 1 and 2, Duck, King Shoals, Mary Chilton Roadside Park, Procious and Queen Shoals. Braxton County access is limited to a small boat landing at the Frametown Bridge and the one at the Sutton Dam tailwaters. OTHER OPTIONS: Monongahela River sauger will be stacking up below the navigation dams. For cold weather crappie, targeting the depths of R.D. Bailey Lake for slabs can fill a stringer.